"Ophthalmology has been close to my heart as my late father was an Ophthalmologist with similar ideals to Sankara Eye Foundation (SEF)", says BU medical student Raagini Jawa, who along with her physician mother Amal Jawa is using music to raise funds for SEF via a Shaam-E-Leher music evening on April 20th at the Diamond Middle School in Lexington, MA. They tell us more about the Shankara Eye Foundation and the wonderful music program Shaam-E-Leher. 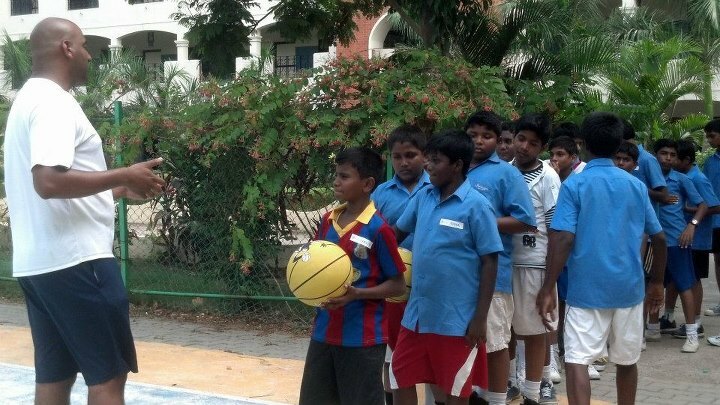 Could you tell us about the Sankara Eye Foundation ? Sankara Eye Foundation(SEF) is a US-based volunteer run non-profit organization, that has dedicated its efforts to eradication of curable blindness. It was founded in 1998 by Mr. Murali Krishnamurthy and Mr. A Khushnood. They work in collaboration with SECI in India. SEF's mission is to realize the goal of vision 20/20 for people of India by the year 2020. Through its efforts, SEF has funded building and maintaining 9 Eye Care Hospitals in India and has completed funding for a million free cataract surgeries so far. Every donation is acknowledged with receipt mail and the amounts are tax deductible when donated. How are funds used by the foundation? All the moneys raised through fundraising, booths, advertising and donations by volunteers of the foundation are sent to SEF sister organization Sankara Eye Care Institute, which is under the Kanchi Kamakoti medical trust. Funds are allocated towards existing eye care projects or new projects and used to fund for eye surgeries for those that are underprivileged and unable to afford the cost. This gives the gift of vision to many that would have remained blind for the rest of their life. Amal could you tell us more about the issue of blindness in India ? Being a physician and fortunate to have worked as a House surgeon in Ophthalmology at the Dr. Rajender Prasad Center, AIIMS, India, I had closely followed and helped people with preventable blindness . The facts about blindness are EYE OPENING! A fourth of the world’s blind live in India. From the 1.2 billion total Indian population, 52 million Indians are visually impaired with 15 million of these being completely blind. An estimated 20,000 children under 16 are blind and every year 4 million new cases of preventable blindness add to the blind population. Considering these numbers the dimension of blindness as a disease entity is huge. 80 percent of these can be prevented and cured. Blindness can be caused due to several reasons as we all know. The most prevalent causes of blindness are Cataract (62.6%), refractive errors (19.7%), glaucoma (5.8%) and corneal diseases (0.9%). There is a close correlation between social and economic deprivation with blindness. Off the list of causes cataract and refractive errors can be cured inexpensively through surgery and use of glasses. SEF has focused on these and is able to give the gift of vision to this patient population by its fundraising efforts. $30 is all it costs to open an eye! Raagini you are studying to be a doctor. Is Ophthalmology in your future? Ophthalmology has been close to my heart as my late father was an Ophthalmologist with similar ideals to Sankara Eye Foundation. I plan on pursuing Internal Medicine with an International Health focus so that I can provide care to the most under-served patient populations. While I will not be pursuing ophthalmology as a specialty, I along with my mother have maintained my dedication through SEF, volunteering and fundraising and helping give the gift of vision to the poor. Could you tell us more about Shaam-e-Leher? LEHER is a group of talented formally trained singers and musicians from the Boston area. Both of us (Amal and Raagini) are part of this band. Since we had been involved with SEF for the past 9 years as volunteers and represented the Boston chapter, we convinced our Leher team to donate their talent to SEF by hosting a fundraiser concert which we named Shaam-E-Leher. The goal for Shaam-E-Leher is to raise awareness about preventable blindness and raise enough funds to give the gift of vision to 100 blind eyes in India.The cost of opening an eye being $30.The whole Leher team is excited to fundraise for Sankara and every member is working hard to make their Shaam- E-Leher journey a big success. 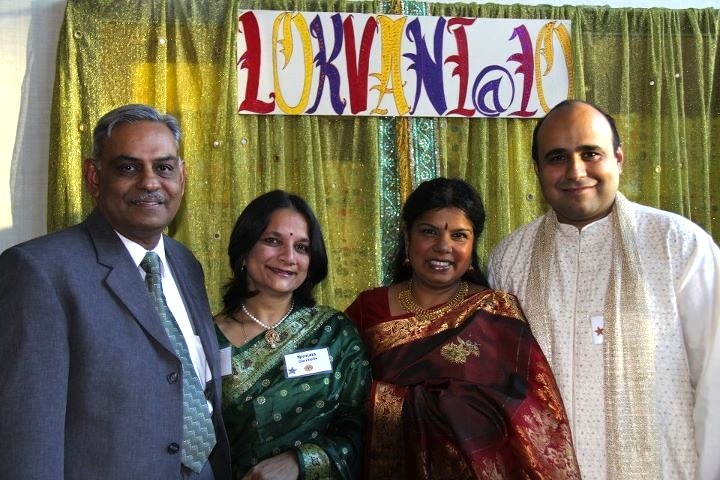 Raagini and I are very fortunate to have in our Leher family, very talented members that include Dilip Acharya, Sunil Barot, Sanjay Jain, Meesha Acharya, Samir Patel, Subhankar Choudhary, Shiva Ramchandran, Chris Pereji and Raj Alur. This is a unique Ghazal/Geet show which would portray scintillating renditions of different ghazal maestros like Ghulam Ali, Mehdi Hasan, Pankaj Udhaas, Jagjit Singh, Runa Laila and the list goes on. Famous numbers like Chupke chupke raat din….., Ranjish hi sahi….are some of the many timeless ghazals which are part of the song list. In addition to the Leher team performances, the audience will enjoy exhibition acts, one performed by students of Raganjali School of music and another surprise act by local singing junior stars. The team has been working real hard to put a great musical concert together and we are sure you all are in for a treat! How is it to work in a mother-daughter team? Raagini and I have been teased by friends as the “Ideal Mother –Daughter Duo” for years. We have a special bond not like a parent and child, but like friends. It was fun to work on Shaam-E-Leher as a team right from the brainstorming inception stage till near project completion. Like any friendship there are no dull moments and we are proud to be a great team with an extended Leher family! 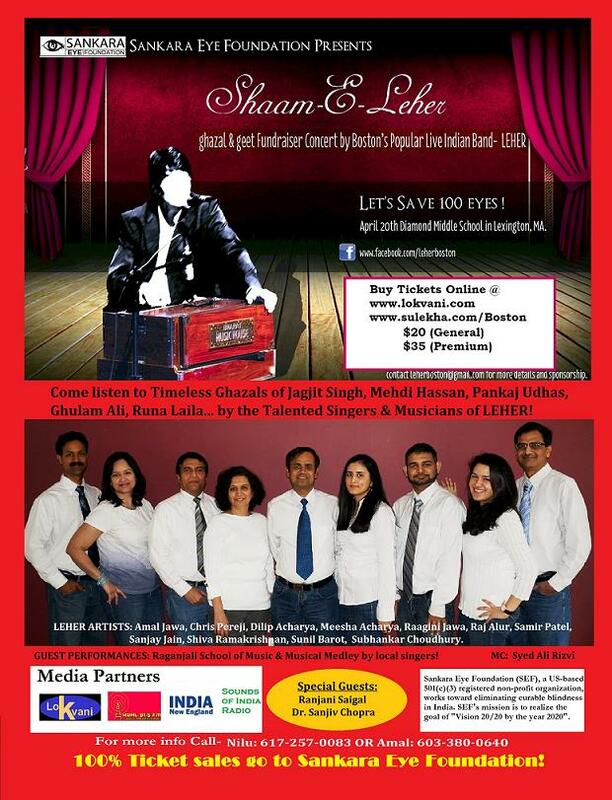 We personally invite everyone to come for Shaam-E-Leher on April 20th at Diamond Middle School and enjoy beautiful music and support our efforts to give the gift of vision to 100 eyes in India.